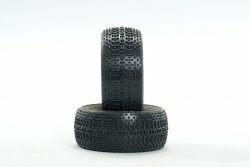 JConcepts Goose Bumps Tires Discounts Apply ! The Goose Bumps are a special breed, designed for maximum performance when new or used as the design allows even wear all the way down to the tire body. Once the driver wears through the initial pin, a bar follows to maximize potential on aggressive surfaces. The Goose Bumps incorporate a compact tire body with a crisp tread pattern with precise separation for intense short course racing competition.